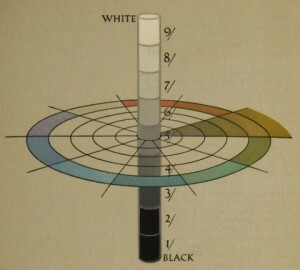 Published in 1921, A Grammar of Color, is a basic treatise on the Albert H. Munsell color system. Containing an introduction by A.H. Munsell, diagrams illustrating the application of the system, two plates engraved by Rudolph Ruzicka showing balanced and unbalanced color and 19 folding sample color sheets that demonstrate various color combinations. The book includes paper samples for experimenting with different colored printing inks and the effect of using them on various colored papers. By Cleland and T.M and Munsell A.H. and published by the Strathmore Paper Company.